All you Bloggers, Webmasters or Internet Enthusiasts are welcome to write for one of the most popular Technology Blogs.Every article will be read by Gautham before acceptance as we maintain a high quality at this Tech Blog.At the end of your article, you can link back to your own website or blog or Facebook page/Twitter account or even to your RSS Feeds.You will be allowed two links.Links in the body of the article are accepted as long as they are relevant.Make sure that you are submitting original content, all the articles will be checked for originality. I am sure all you bloggers will be aware of the importance of relevant backlinks, so if you have a site of any of the following topics, then I strongly recommend you write for us. 7)How-To articles related to Tech. You can E-Mail me your Articles with relevant links and pictures to - sparklexecute@gmail.com. 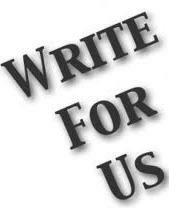 1)We have over 300 E-Mail Subscribers to whom your article will be sent. 2)We have over 300 Twitter Followers with whom your article will be shared. 3)We have over 3900 Facebook Followers with whom your article will be shared. 4)You will get two Links worth Page Rank 2. 5)We have a high traffic site, of Alexa Rank less than 93K, due to which you will receive a lot of exposure. 6)You are welcome to use your own Adsense Ad in your article to earn revenue.Please send us a code for 468X60 if you want to use your own Adsense Ads. If you have any doubts, you can Contact Us.Do not miss this opportunity to Guest Blog.